A Roman funerary urn (cinerarium) with fluted Tuscan pilasters at the corners and a central name plate framed with double mouldng strips. At the corners of the lid are antefixae decorated with inset rosettes and there is a similar rosette flanked by stylised foliage within the triangular pediment. You are here: CollectionsOnline / A Roman funerary urn (cinerarium) with fluted Tuscan pilasters at the corners and a central name plate framed with double mouldng strips. At the corners of the lid are antefixae decorated with inset rosettes and there is a similar rosette flanked by stylised foliage within the triangular pediment. There were various Roman families bearing these names under the Empire; none seem to have been among the nobility. 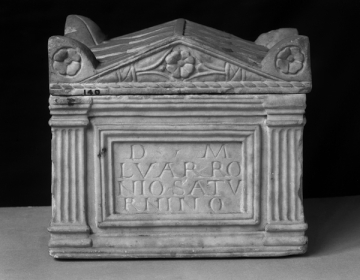 This is an example of a rectangular cinerary urn with a large inscription plate and flanking fluted pilasters on the corners. For similar urns see W. Altmann, Der römischen Grabaltäre der Kaiserzeit, Berlin, 1905 Chapter XII, esp p.146, fig.119. For an identical urn in Berlin, see Königliche Museen zu Berlin, Beschreibung der antiken Skulpturen, Berlin, 1891, p.439, no.1132, and for a somewhat more elaborately detailed variant of this composition in both lid and urn, compare The British School at Rome, Catalogue of ancient sculptures preserved in the municipal collections of Rome: The sculptures of the Museo Capitolino, H.S. Jones (ed. ), 2 vols, Oxford, 1912, p.56, no.12, pl.11. Possibly in Soane's collection by 1802 when Vermeule considered it was one of those shown in J.M. Gandy, watercolour design for the Library at Pitzhanger Manor, Soane's country house at Ealing (SM P94); if so it is shown without the incised lines on the pilasters and with the whole urn and the inscription in partiuclar in portrait format whereas the actual urn is more horizontal. If it is shown in that view then at that time it appears to have had a modern base no longer with the piece.